Following a devastating tornado two years ago, the town of Smithville, Mississippi, has started construction on a tornado-proof dome. 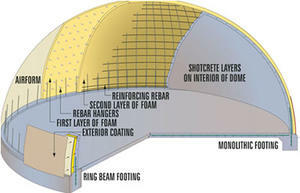 The dome, to be built on the grounds of the local high school, will double as a gym and a storm shelter. Other towns in Mississippi have also begun their own dome projects. The town of Smithville, Mississippi, has started construction on a tornado-proof dome, two years after a powerful tornado inflicted significant damage to the town. WCBI-TV report last week that the dome will also serve as a gymnasium, recreational complex, and storm shelter. The dome will be located on the campus of the Smithville High School. “We embed that rebar and when the rebar is all embedded, we let the concrete cure for a little while, turn the fans off and you got a concrete building,” South added. The tornado that struck the town on 27 April 2011 hit the school campus along with 80 percent of the town with winds of over 200 mph. Seventeen people were killed in the tornado. After the tornado, state and federal officials decided to build a new gym that could double as a shelter to increase safety. The dome is expected to hold more than 800 people. Another dome project is in the works for East Webster High School in Webster County, which was also hit by a tornado during the same outbreak. Other domes are being considered for the Hatley and Hamiliton school campuses in Monroe County.